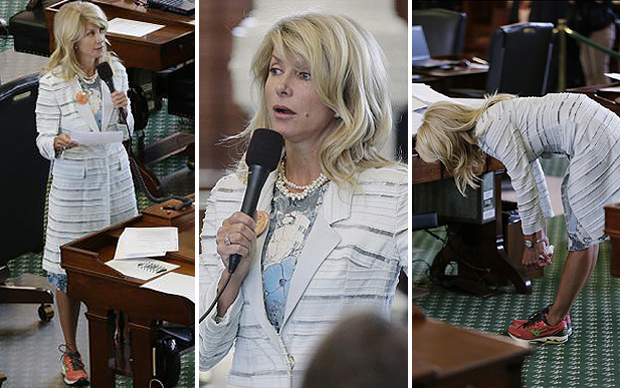 Texas State Senator Wendy Davis looking chic while filibustering. Over 11 hours standing – no sitting, no leaning, no breaks. Wow! Thank you, Texas State Senator Wendy Davis. This past Monday, Senator Davis successfully filibustered a Texas measure that would have banned abortions after 20 weeks of pregnancy and essentially led to the closure of most abortion clinics in the state. I’m always interested in what one sports in situations such as this, where a professional presentation is important but comfort is crucial. Senator Davis chose a sheath floral-print dress by Erdem topped with a sleek light-weight coat (apparently she wore a back brace under the coat). Key were the shoes – the Wave Rider 16 running shoe by Mizuno, in pink. A pairing that said, I’m here to do a job. Accessories included a double strand of white beads or pearls and a something on her coat. I can’t quite tell what it is, perhaps a brooch or a badge but whatever, it’s a nice pop of color. In her simple tailored ensemble Senator Davis has made the point, however unintentionally, that dressing well is imperative when engaged in very serious matters. All the way around, a job well done. Tziporah Salamon. Photo: Ike’ Ude. A couple of weeks ago I was in downtown San Francisco fabric shopping at Britex and meeting a few fashion students for an interview. As I dashed past the St. Frances Hotel, a smart-looking woman popped out of the crowds wearing lots of color and a tall hat. I knew instantly that she was not from around here and more than that, if she wasn’t one of the Advanced Style ladies from NYC, I’d eat my hat. Fast forward more than a week – reading the San Francisco Chronicle I noticed the same woman featured in the Style Section Buzz column. Well, it turns out my mystery lady is Tziporah Salamon and indeed she is from NYC and part of the Advance Style set (so my hat is safe). Ms. Salamon was in town as guest of honor for Jennifer Evans’ launch of a new line of evening gowns by The Factory. 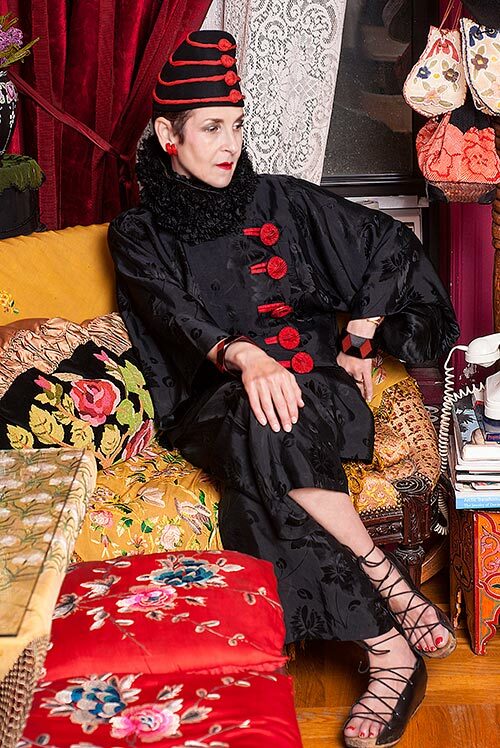 I was over-the-moon to read Ms. Salamon is returning on Sunday, June 30th to give her lecture Art of Dressing, where she shares tips on how to dress creatively and exhibits pieces from her extensive collection of vintage and antique clothing. I can’t wait! You too? Contact Ms. Salamon for ticket information: tziporahsalamon@gmail.com. Hats are hot on Team Fortress 2 by Valve. Guns are worthless, you want the hats. – Robert Cass, photo technician and player of Team Fortress 2. 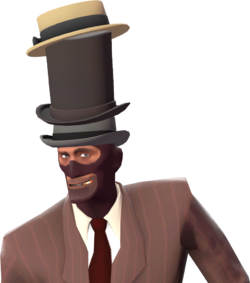 Apparently hats are the must-have accessory for avatars in the video game, Team Fortress 2. As reported in Women’s Wear Daily, game players are hot for all kinds of hats that are, within the game, locked away in crates and require skill to acquire. Hats have become so desirable players will trade and sometimes even purchase (using real money) from each other. Hey, avatars needn’t have all the fun – let’s bring this trend onto the real world streets. Hats for everyone! 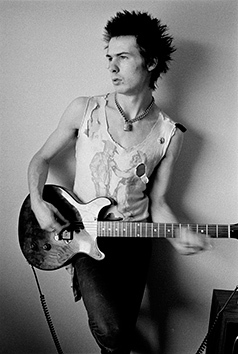 Sid Vicious in 1977. Photo: Dennis Morris. If a squatter in present-day south London covers a beat-up jacket with studs, that’s punk, right? But what if Karl Lagerfeld put studs on a $5000 jacket? Is that punk, too? – Maya Singer, writer and special projects editor at Style.com. Ms. Singer poses this question in her editorial on the current exhibit at the Metropolitan Museum of Art in New York – Punk: From Chaos to Couture. To answer Ms. Singer’s question I’d say no, Mr. Lagerfeld’s jacket is not Punk. Punk is, or was, all about intention. People in the 1970s wore torn t-shirts, ripped jeans and studded jackets not for fashion but to express their anger over current society norms and Thatcher/Regan politics, as well as to distinguish themselves from the mainstream. Mr. Lagerfeld is using vintage Punk aesthetics in fashion for commercial gain – the antithesis of the Punk movement. But the squatter’s jacket is not Punk either. A rebel of 2013 is another generation and has a different point to make. She would find her own look to communicate, not copy what has already been done nearly forty years ago. Karl Lagerfeld jacket. Photo: David Sims. Corporate designers can refer to Punk and dissenters can imitate it, but neither can be the real thing. Punk was a look (not a fashion) with a message at very specific time and exists only in history. Well, that’s my brief two cents. Image courtesy of AiCASF. Gown by Hieu Nguyen. 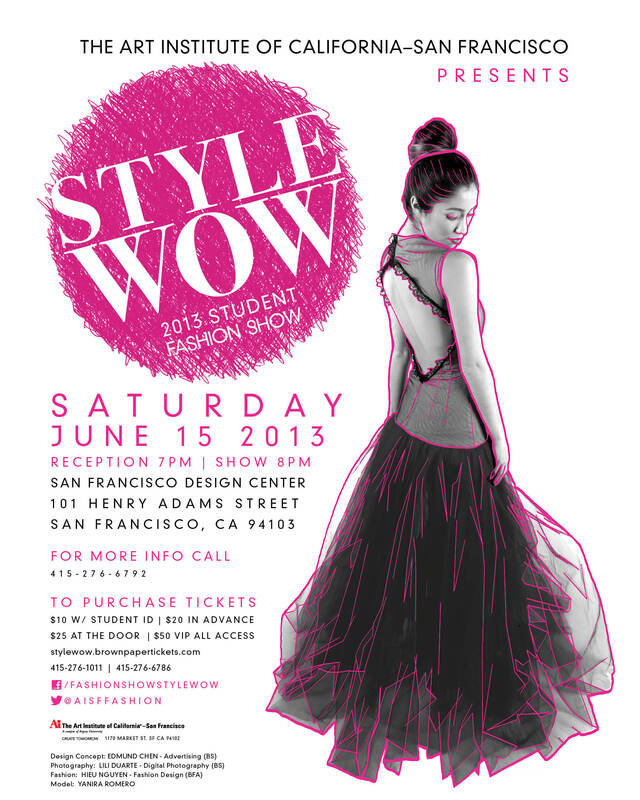 StyleWOW, the Art Institute of California (AiCASF) Student Fashion Show is coming up on Saturday, June 15th, 7pm at the San Francisco Design Center. Last week I was fortunate to meet some of the participating students and get a sneak peek at the featured fashions. I’m really impressed with each student’s creativity and the thought and attention they have put into the process. Christopher Maracha has created a line of men’s active wear using mesh as a layering fabric . The works of French artist Augustin Lesage inspired Rie Yamamoto to create her own fabrics for men’s coats. Using textured fabrics and layering, Fiona Leung designed a line of chic evening wear for women inspired by the ballet, Romeo and Juliet. Francisco Rodriguez is thinking outside the fashion box with his use of soft vinyl for women’s dresses and skirts. Hieu Nguyen’s formal ball gowns are all about romance in luxurious lace and tulle. To be included in the runway show students applied last fall and twelve were selected by Fashion Director, Geetika Gupta. Students from other disciplines are working together on the event including Fashion Marketing, Media, and the International Culinary School is catering the VIP reception. “This year, I am so delighted that students from programs other than Fashion are greatly involved in the show,” says Gupta. StyleWow promises to be an evening of fashion fun and inspiration. Follow the blog. Like the Face Book Page. Reminding you that casual never means careless and that the appropriate is always the aim of the woman with a true sense of Fashion and the taste that goes with it. – Claire McCardell, celebrated American women’s fashion designer of the 1940s and 50s. This quote is taken from Ms. McCardell’s 1955 book, What Shall I Wear? : The What, Where, When and How Much of Fashion, which was recently reprinted by Overlook Press. 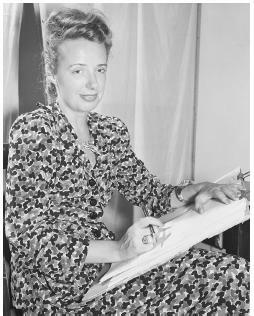 Ms. McCardell’s designs helped put America on the fashion map after World War II. While Paris was getting back on its feet, America launched ahead in fashion and Ms. McCardell was among the leaders. Designing for the new active woman, she favored mix-and-match separates and was the first to make denim a chic option. Photo courtesy of Lesley Evers. I recently had the pleasure of meeting and interviewing Bay Area designer Lesley Evers. Ms. Evers creates bright and bold clothing for women and is quickly becoming a true Fashion Star. Click here to read my article for the Lamorinda Weekly.